Unemployment in many European countries has risen sharply due to the credit crunch and global recession. 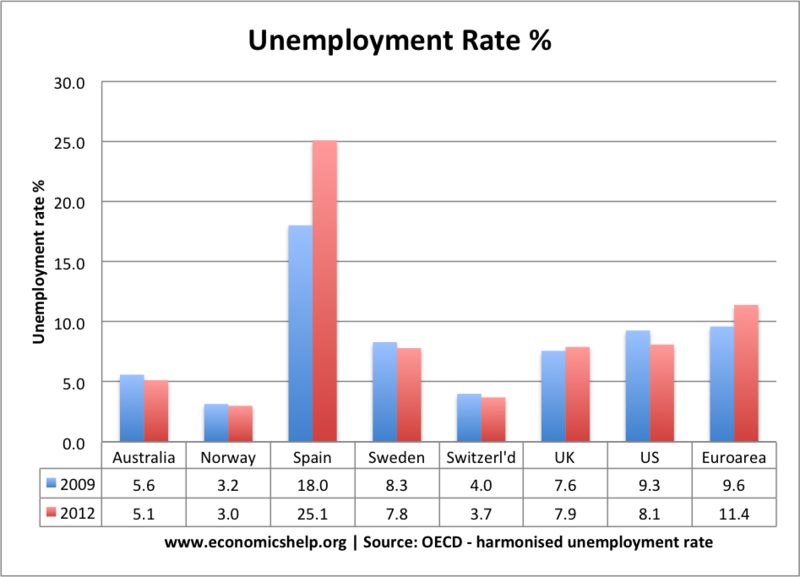 The worst hit countries include Spain (ES) and Greece (EL), who both have unemployment rates of over 24%. In the past few months, there has been a slight reduction in European unemployment, but the prolonged period of mass unemployment is leaving significant social and economic problems for the whole Eurozone. 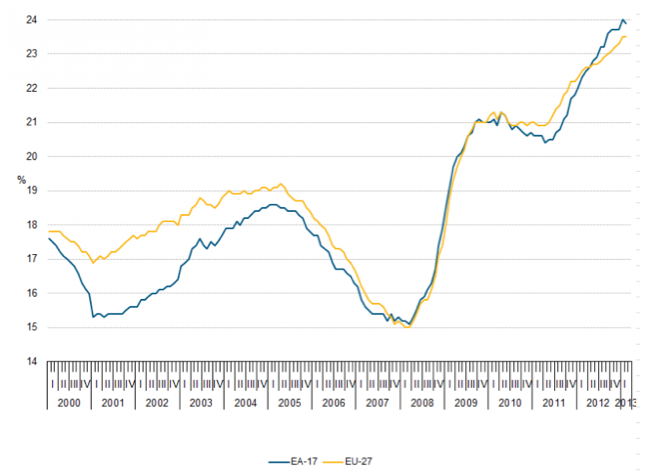 The Eurozone (EA-18) jobless total is now 18.409 million. (link) The highest since records began. The lowest unemployment rates are in Austria (4.9 %) and Germany (4.9 %). The highest rates are in Greece (27.2 % in January 2014) and Spain (24.5 %). After falling to 7.5% in 2008, the prolonged recession of 2008-13, has caused a sharp rise in unemployment. The continent seems to be stuck in a deflationary spiral and is facing a prolonged double-dip recession. Hardest hit debtor countries, such as Spain, Greece, Portugal and Italy are facing stringent budget cuts – which are depressing demand. 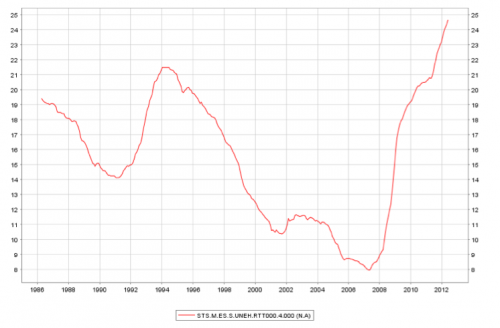 But, in the Eurozone, there is little relief available to boost demand. Countries are unable to devalue. Monetary policy set by the ECB has been unflinching in targeting low inflation and offering little monetary easing – despite the prolonged recession. Also, depressed demand throughout the region is making it difficult to grow through increasing exports. 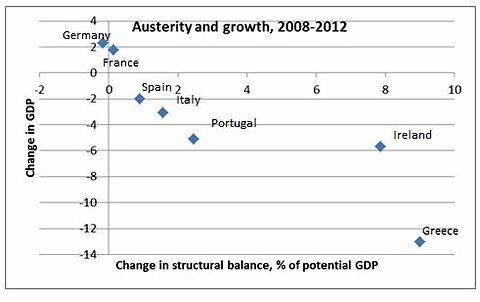 Even northern Europe, which has had large current account surpluses are engaging in modest austerity. The result is that demand has remained depressed across Europe. Despite its potentially damaging social and economic impact, throughout the 2008-13 European crisis, unemployment has had a relatively low profile – European policymakers have always given the impression they are more concerned about appeasing bond markets and low inflation than tackling the more pressing problem of unemployment. There has been a reluctance to tackle the fundamental deficiency of aggregate demand which is leading to lower growth and falling employment. Efforts to reduce unemployment have centred on talk of more flexible labour markets. This may be part of the solution for structural unemployment, but increasing labour market flexibility alone cannot deal with the cyclical unemployment. Generous unemployment benefits which encourage frictional unemployment. Strong labour market regulations which discourage firms from investing and taking on new workers. Youth unemployment rates count the % of young people actively seeking work unable to find work. It ignores the large student numbers and this is one reason why youth unemployment rates are higher. 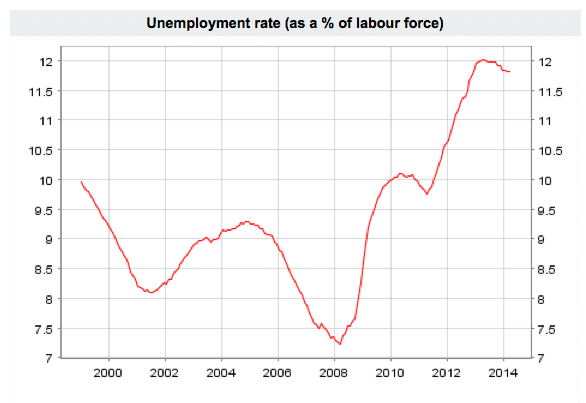 Does fiscal policy solve unemployment? This entry was posted in economics and tagged unemployment. Bookmark the permalink. ← Economics – Science or Art? If there is a European unemployment crisis then why are there not more restrictions on the arrival of new workers into Europe? I am not writing this from a bad point of view but in economics I read about America limiting labour inflows in the 20s and 30s. 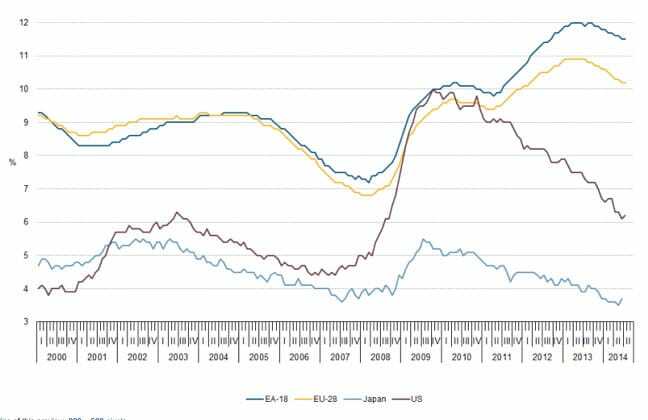 It seems obvious that countries like Spain and Greece with over 25% unemployment and close to 60% unemployment for young people to limit the arrival of new workers. There seems to be no logic to this?